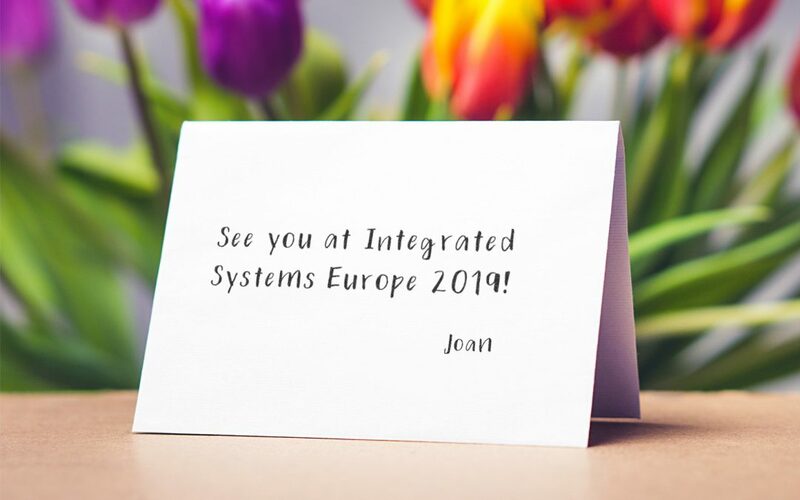 Friends, partners, clients, lend us your ears – Joan is going to ISE 2019. From 5 to 8 February, your favorite room booking solution will be at the RAI Amsterdam and at your disposal. The award-winning digital e-paper device that’s been scheduling meetings in countless organizations worldwide will be presenting its amazing capabilities at three separate booths. Hall 14, Booth M230, (Joan). This year, over 80,000 attendees are expected to visit the 1,300 AV and systems integration show, making it the hottest, and also the busiest event of its kind. To skip the line to our booths and ensure you get the attention you deserve, book a meeting in advance. You don’t have a ticket to ISE? No problem. Luckily, our partner COMM-TEC and Joan are giving away free tickets. Be sure to get yours by registering here. Simply follow the steps, insert the code: 704309, and enjoy the show. In addition to acquiring priceless info on ground-breaking technologies and taking advantage of incredible networking opportunities, ISE’s Main Stage is guaranteed to broaden your horizons on a rich variety of subjects. You will get a chance to attend a number of exceptional conferences and eye-opening interest groups as well as listen to some mind-blowing lectures by top-class experts. One of these will also be delivered by Joan’s very own Lex de Grijs. His speech “Why workplace transformation is your #1 business problem” tackles the use of modern workplace tools, how they influence today’s trends and ultimately lead to workplace transformation. An interesting insight that should definitely be added to your ISE agenda. For a clearer overview of education and training sessions taking place at the event, check out this handy Professional Development Guide. We know that attending these large exhibition shows can be hectic, especially if you’re traveling from abroad. So to make your experience at ISE 2019 a productive and pleasurable one, we present you with a list of useful tips for getting around. See you there / Zie je daar!